Brad Seng, driver of the No. 12S S&S Transport Mars MB Custom and Dustin Strand, driver of the No. 71S Q&Z Plumbing and Heating Millenium were series winners at the speedway last season. This race is also one of the events scheduled for night one of the 118th Norman County Fair. Racing begins at 7pm. 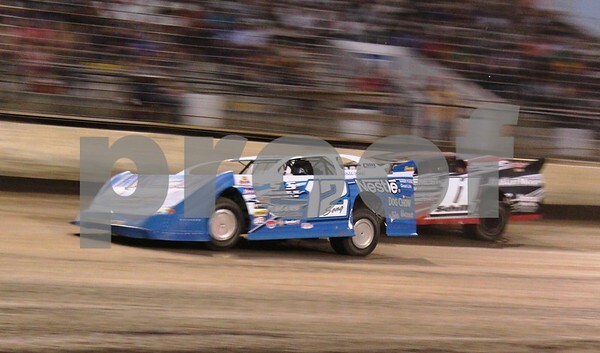 Friday night the NLRA will race at the River Cities Speedway in Grand Forks, ND. The event will be the 16th tour race for the series at the High-Banked 3/10 mile track that many NLRA regulars call their home track. Defending NLRA champion Brad Seng has two previous series victories at the speedway. Other winners at River Cities include Joey Pederson in the No. 7P Dahlstrom Motors Mars MB Custom with two victories, and Steve Anderson driver of the No. 9 Big Trucks by Jimco (Chassis) with one win. Racing begins at 7:30pm as the NLRA races with the World of Outlaws Sprint Cars.